April 12, 2016 January 2, 2017 / Elizabeth T.
It’s that time of the year again! Yes, you’re right – it’s time for Coachella! As many of you probably already know, Coachella is an annual arts and music festival that is held in California every spring, and every year, people come from all over the world to appreciate the wide variety of music and art installations/sculptures! Aside from the great music and art, though, Coachella has been a staple in the fashion scene these past few years, as many celebrities, YouTubers, bloggers, and fashionistas use this festival as an opportunity to showcase bohemian chic outfits with just the right touch of desert-romance. I’m always so inspired by all of these inspiring ensembles, from the drapey cardigans to the lacey kimonos, but of course what’s most enchanting is watching how everyone tries to style practical outfits that allow you to stay cool and comfortable in the heat while still looking like a million bucks (and trust me, it’s hard to look that put together when it’s 100 degrees outside, and you’re sweating bullets from all of the dancing and running around). I find that rompers make the best outfits for summer traveling, particularly if you’re going to be very active. Since rompers are almost like shorts, it’s a lot easier to walk around in, but at the same time, the airy cutout makes it very easy to cool down in the heat. I also love how they’re a one piece, meaning you can save room in your suitcase as well, since it’s basically already the whole outfit. The tricky thing about one pieces, though, is that they can sometimes visually blend together to look like one huge glob, especially if there isn’t a very distinctive waistline. 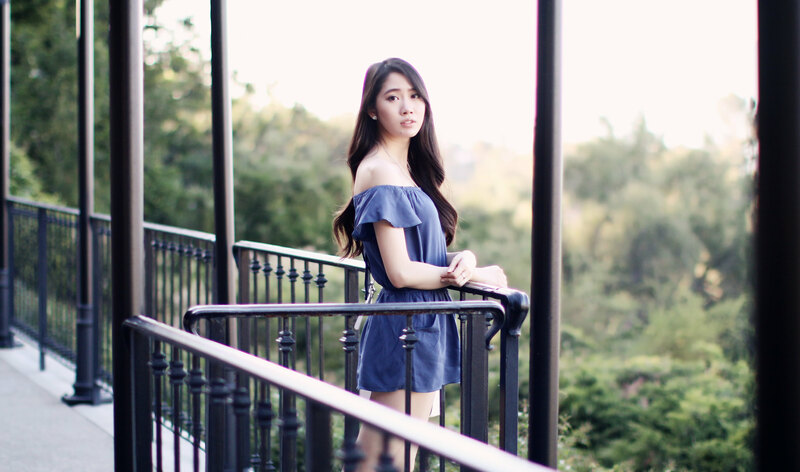 This is why I picked this particular romper from Tobi. I love the off-shoulder cut because it just looks so much sexier, and plus, the little ruffle sleeves add just the right element of fun to the whole ensemble. The waistline is also elastic, making for a fitted silhouette that helps to showcase the body’s curves without being too stuffy. What I love the most, though, is the cut-out lace detailing in the front, as well as the cut-out in the back. It’s little details like this that set this romper apart from the rest and really make it special. The lace adds an element of bohemian chic to the outfit, and it’s very romantic without being too overbearing as well. Aside from being comfortable with clothing choices, I think the kind of shoes you wear are very important too, since you’ll want to be super comfortable while still looking chic. Though I would normally pair rompers with sandals, I think booties, like the faux leather ones that I’m wearing, will be the most practical, since they’ll help to protect your toes from being stepped on by throngs of people, and the little heel isn’t too much to make you uncomfortable or tired from walking around all day. 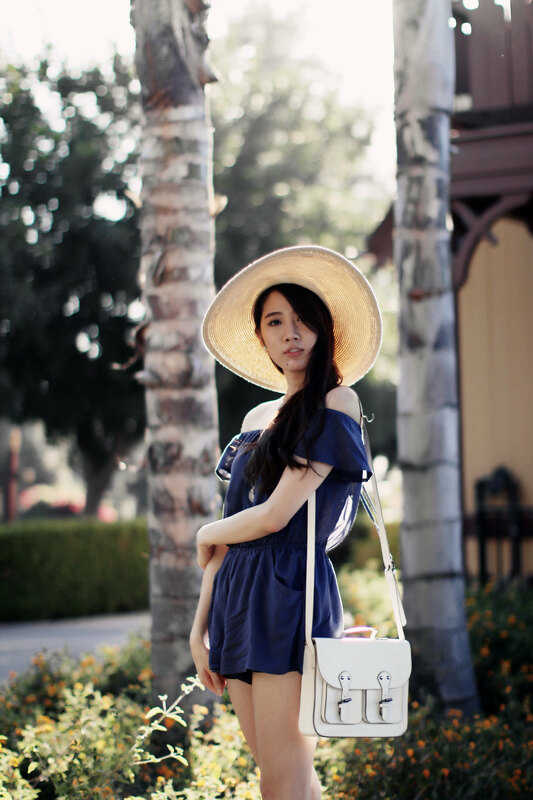 To finish off the outfit, I paired the ensemble with a nice straw hat to cover myself from the blazing sun, and of course, a small white bag to keep all of my belongings in one place. Such a great romper! I love the detail in the front and how you paired it with the floppy hat! You’re making me so ready for summer and warm weather! Thank you so much Caitlin ❤ The detailing is my favorite part of the romper too 🙂 Haha and yes, I'm totally ready for the summer and warmer weather too! Thank you so much Jasna ❤ 🙂 Glad you liked this outfit! Such a beautiful look with this amazing OTS romper! Hahaha aww thank you so much for your generous words, Juliette ❤ You're too sweet 🙂 Hope you enjoyed this look! Thank you so much Helena ❤ 🙂 You're too sweet! I'm glad you enjoyed this post and my blog! Thank you Alyssa ❤ It's from Tobi! such a great outfit for coachella! Aww you’re too sweet love ❤ 😀 Hope you enjoyed this post!